Nippon Shikizai is proud to present its international achievements gained through its own original research and development. Nippon Shikizai is attracting attention, globally, from their advanced research and development in cosmetic science and technology. The IFSCC ( International Federation of Societies of Cosmetic Chemists ) is a worldwide federation dedicated to international cooperation in cosmetic science and technology. 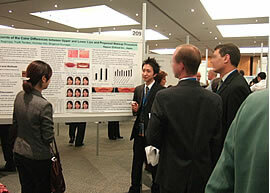 They host a biennial global congress for cosmetic products in selective major cities in the world. IFSCC has over 14,000 individual members from 45 countries. At the 28th IFSCC Congress (International Federation of Societies of Cosmetic Chemists) Nippon Shikizai announced the result of one technical development study. 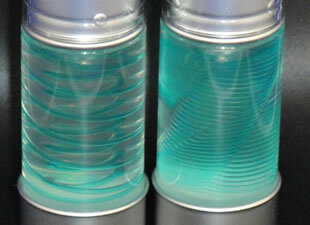 Recently, cosmetic products with ultraviolet (UV) protection are in great demand on the market. Among them, loose powder type products have excellent characteristics such as easiness of reapplication and natural complexion finish. However it is difficult for loose powders to absorb the adequate amount of UV absorbers to achieve high UV protection because of the problems such as caking and cohesion. 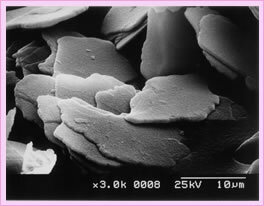 In this study these problems were solved by using petal-like calcium silicate (P-CS) as it has a high oil absorption value. Finally, we accomplished an innovative loose powder with both extremely high UV protection and an excellent texture and usability. At the 27th IFSCC Congress (International Federation of Societies of Cosmetic Chemists) Nippon Shikizai announced the result of one technical development study. Although water-based gel design filler products have been on the market for some time, most of these skin care formulation products are not sufficient in retaining moisture (low emollient properties) and maintain a design. In general, design filler products maintain a 3D design image within a transparent gel making a cosmetic product aesthetically appealing. Our study on the rheological properties of oil-based gel design filler was performed to develop a better understanding and a process to enable better design drawing capabilities and emollient properties. The procedure was recognized as technically difficult to achieve but our results were the success of producing an oil-based design filler product with better emollient properties and drawing functions. 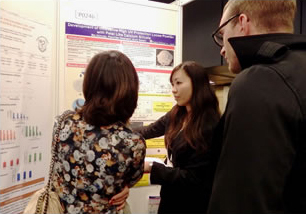 At the 25th IFSCC Congress (International Federation of Societies of Cosmetic Chemists) Nippon Shikizai announced the results of two technical development studies. 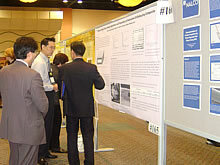 IFSCC is a global congress on cosmetic chemistry. The 25th IFSCC Congress took place in Barcelona, Spain for 4 days, starting on October 6. 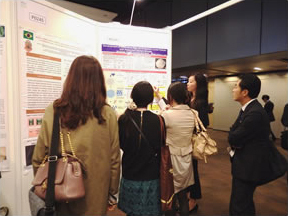 At the biennially IFSCC Congress which is held in selective cities worldwide, Nippon Shikizai has presented research seven times, since 1994. 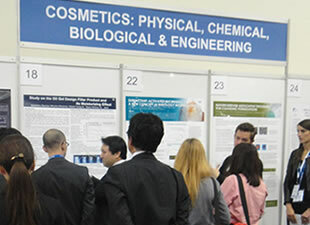 Nippon Shikizai was the first company to receive the opportunity of introducing scientific papers as a cosmetics contract manufacturing company at the IFSCC congress. 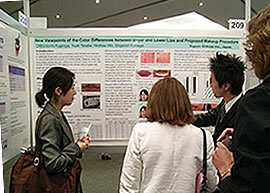 Presentation of a formula technology that enables intricate cubed design on pressed powdery cosmetics, such as face powder. Proposal for a new make-up technique to show lipstick’s color, beautifully on lips. Also included is a presentation of the technology development that enables this effect. 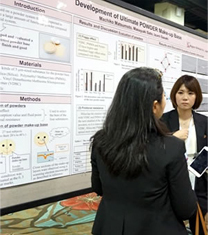 At the 24th IFSCC (International Federation of Societies of Cosmetic Chemists) Congress, Nippon Shikizai announced the study results of two technical developments. One, regarding the evolution of lipsticks from a crystallographical study of botanical oil-wax structure, and the other study involving the Nanotechnology of powder material, respectively. We found out that among various botanical waxes, a wax obtained from by-product of rice bran is efficient in the stabilization of botanical lipsticks. Recently, various cosmetic materials such as “Light-Filtering” powder or “Foggy-effect” powder that covers skin’s imperfect feature e.g. spots, freckles etc have been studied and developed by using various kinds of technologies. In general, it is really difficult to design those kinds of materials because it is necessary to control particle size, shape, or other material nature. This means there is a need to consider huge factors and to repeat numerous complicated calculations in order to get an ultimate cosmetic material. In this work, we made a blueprint (Figure 1) of the composite that accomplishes both the effective reflection of the UV light and the high transparency of the visible light by using the Genetic Algorithms (GA). GA is the method that incorporates the idea of the theory of evolution and gives us the optimized factors (superior individual) through following processes; selection, crossover and mutation. It is therefore an advanced method when there are huge amounts of factors that we need to consider. Next, the composite was prepared in accordance with the blueprint (figure 2, 3). 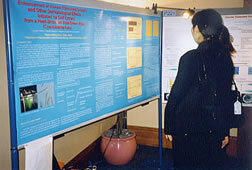 Further we found that it had an effective reflection of UV light while it had high transparency of visible light. Moreover, it had a better feeling-on-use compared with general ultra fine titanium dioxide. From these results, the composite is expected to become useful new UV-shielding pigment. Figure 1 Blueprint of the ultimate UV-reflecting composite, obtained by using GA. Figure 2 SEM image of UV-reflecting composite. 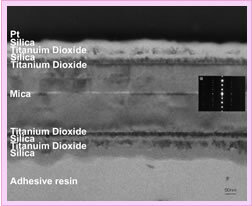 Figure 3 TEM (cross-section) image of UV-reflecting composite. 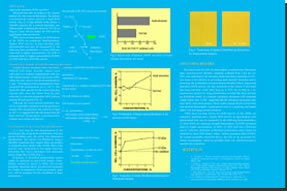 The property of stimulating the growth of fibroblasts and other useful potentials of cyanobacteria after a heat shock. It is widely known that aging of the skin is caused externally by ultraviolet (UV) light and internally by reactive oxygen species (ROS) produced in the body. For anti-aging, it is an important challenge to prevent ROS from oxidizing living tissue of the body. Aging, in its course, would negatively affect the growth and functions of fibroblasts, causing dermal changes, which in turn cause wrinkles and laxity. Cosmetics are expected to protect the skin from such damaging oxidization more effectively. Our research presented this time is to study the effectiveness of the crude extract of cyanobacteria before and after heat shock for comparison. The cyanobacterium, found in hot spring, is thermophilic. The sample of cyanobacteria after heat shock is to be prepared by exposing to a higher temperature than the normal culture setting. The result shows that the cyanobacterium extract has such anti-activation property as SOD (superoxide dismutase) activity and inhibition of lipid peroxide formation. 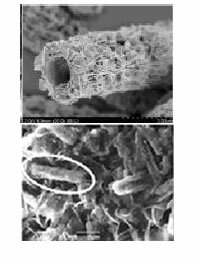 On the other hand, it is also found that the cyanobacterium extract after heat shock has the property of stimulating the growth of fibroblasts as well as these two anti-activation properties and that the SOD activity of the cyanobacterium extract shows great heating-resistance. 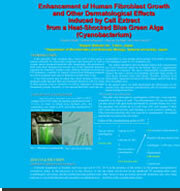 Based on these results, it is assumed that the cyanobacterium extract be of effective use as an ingredient of anti-aging cosmetics, and we expect new products and applications to be developed with the use of cyanobacteria in the anti-aging field.